Dr. Randi Case graduated from New York Chiropractic College in 1997, and since then has practiced in several areas including upstate New York, the suburbs of Chicago and Scarsdale, New York, before settling in Morristown. She took over Morris Spine & Sport, which has been a part of our community for 30 years, serving families and individuals with natural chiropractic care. All ages and conditions are welcome in our practice. Our highest priority is to relieve any pain you’re experiencing as quickly as possible. 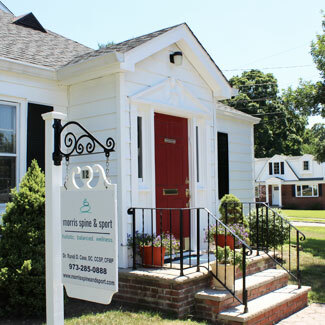 It’s our goal that you’ll leave your appointments feeling better than when you walked in. From the moment you call to schedule your appointment, we show you the respect that you deserve and genuinely care for each of our patients as individuals. Dr. Case is an excellent listener, taking her time to understand your unique situation and what your goals are. She’s seen patients who were in excruciating back or neck pain that felt incredible after just a couple of visits. You can think of chiropractic care like peeling back the layers of an onion. Though you may be free from discomfort quickly, there can still be additional layers that need to be addressed afterward to fully correct your particular issue. If we don’t see the progress that we’d hoped for in your care, we’ll figure out a new way to proceed. Dr. Case also offers nutrition and functional medicine, which can show fantastic results to those who haven’t gotten answers elsewhere. With many techniques available and the use of therapeutic modalities, we’ve seen numerous people recover their health and return to an active, happy life. Contact our chiropractic office today to arrange your first appointment! We accept Medicare and insurance and are in-network providers with many area plans.